Example: When testing a 100-foot diameter tank containing a product with a measured specific gravity of one, a one gallon loss of fluid will result in a head loss of 1.7/100,000 foot (about 0.2 mils). 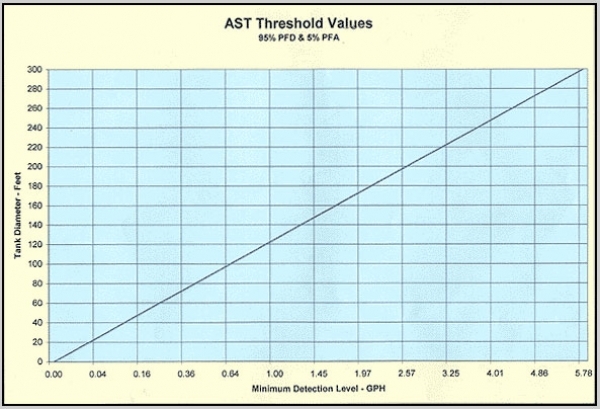 The accuracy necessary to measure that one gallon loss requires a measurement threshold 5000 times more precise than custody transfer requirements of +/- 0.1 inch. The resolution achieved by Mass Technology’s transducers is 0.1 PPM or 3/1,000,000 foot (0.04 mils). Which means that our mass measurement system detects losses of less than one gallon per hour (GPH) in a 100,000 gallon bulk storage tank. Mass Technology’s mass measurement leak detection technology is mass-based and will detect increases and decreases in content of the tank. We detect water leaks into tanks as well as product leaks out of tanks. Mass measurement is not affected by temperature induced volume changes of stored product in tanks. With the sensitivity of Mass Technology’s transducers and our ability to compensate for factors that cause variables in the measurement, Mass Technology is able to detect leaks in a 100 ft. diameter tank as small as 0.64 GPH. The 0.64 GPH detection threshold was determined by third party evaluation of the Mass Technology system. Regulations require a false alarm rate of less than 5% at a leak rate of 1GPH in a tank of 100,000 gallon capacity. Mass Technology’s mass measurement system has a minimum threshold for a 5% false alarm rate of 0.319 GPH, less than one-third the allowable rate. Copies of the evaluation report are available by contacting Mass Technology or can be viewed online.